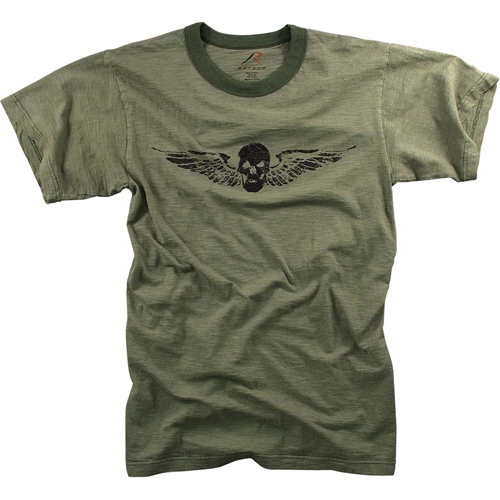 Vintage OD Skull and Wing Slub T Shirt from Ultra Force is made with a blend of polyester and washed cotton. As it is made of heavyweight material, it is strong, durable and long lasting. It looks trendy and stylish. The olive drab colored T-shirt with skull imprinted in black and white color makes it stylish. The T-shirt with vintage look is super soft on skin. The tag less label makes it more comfortable to wear. The 100% cotton material makes it perfect for screen printing. It is a much preferred by teenagers and young adults. The skull with wing imprint on the front side makes it look more attractive.